I’m a mushroom lover. My brother is a mushroom hater. We didn’t have exposure to mushrooms growing up so I can’t explain why our paths took these different routes. I love the earthy, meatyness of mushrooms. He swears that he can tell if something has mushrooms in it even if they are cut up teeny, teeny, tiny. I have yet to put this “ability” of his to the test but I’m confident that I could slip some mushrooms past him without causing suspicion. I think it’s the idea of them skeeves my brother out. To me that’s a sad reason to banish something from your diet without even giving it a try. Sure, I guess we all have our own food prejudices. I wouldn’t touch beets because they grossed me out in their pickled form. But then after I tried them roasted, I couldn’t get enough of them. My prejudice against pickled beets kept me from enjoying any beets for years. I only have myself to blame for that loss. So to my brother, and any other mushroom haters out there, I say give the mushrooms a chance. BAH Note: It’s ok if the baking dish you use isn’t quite big enough for all the mushrooms to fit without being crowded. They will shrink as they cook. Heat the oven to 400 degrees. 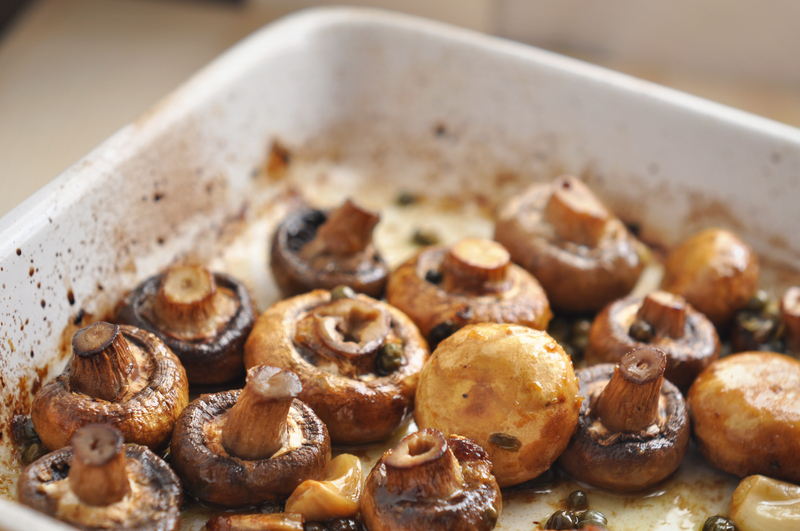 Combine all ingredients in a shallow baking dish and bake for 30 to 45 minutes or until the mushrooms are beautifully glazed with the sauce and slightly shriveled. Thanksgiving. Or a random Sunday supper. These babies are anytime good. j’adore mushrooms, any size, any way. pls do share how you would sneak mushroom attack your brother. I would puree them and then sneak a wee bit of that into a meat based dish. I swear he’d never know. Jenna, in my post Alaska haze, these easy ‘shrooms are about all the focus I can pull together for cooking. Maybe I’ll throw a batch in the oven this weekend. I have always wanted to go to Alaska…..Oh, I love mushrooms also, in butter……. I’M BACK! And you should totally go to Alaska at least once. Isn’t that right Jenna? Just don’t go in the rainy season. Or the snow season. Unless those happen to be your thing. Mmm I love the smell of mushrooms roasting. These look fabulous!! Tracy, I highly recommend these.� They are delicious.